MINI Cooper Acccessories + MINI Cooper Parts :: OutMotoring.com MINI Blog :: MINI Lifestyle :: Laptops and pencils and coins... Oh, my! 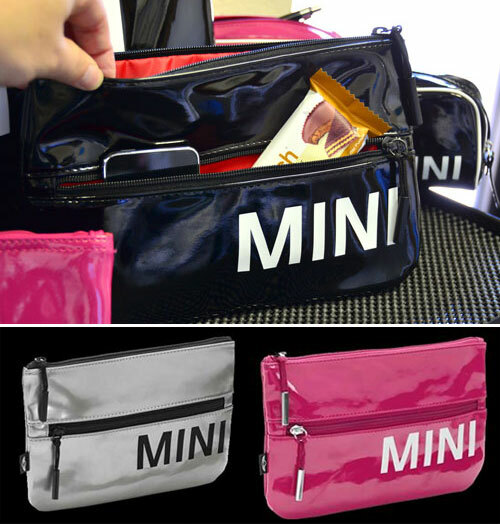 Synopsis: MINI pouches are available in a variety of sizes and colors for whatever your needs and style may be! This handy pouch features two compartments each with a zipper and provides space to store essentials. With accent lining and MINI wordmark on the front. Dimensions: 10½" x 6½". Available in Black, Silver or Berry. Whether you fill it with coins, keys, or other essentials, this pouch is a great way to keep your stuff organized and protected. Red lining with keychain tab. Dimensions: 4" x 5⅞". Available in Black, Silver or Berry. This handy pouch is big enough to stash a small collection of pens, sunglasses as well as cables, or other stuff that follows you around. It has a red contrasting lining and a tonal zip. Dimensions: 3½"x 7⅝" x 2¼". Available in Black, Silver or Berry. Laptop sleeve with MINI logo. Red lining with small interior pocket Dimensions: 11x15". Shown with a 13" Macbook Pro for scale reference. Available in Black, White or Berry. Comments on Laptops and pencils and coins... Oh, my!